For today’s discourse, I will be referencing the image shown above. It is a label I ripped off a bundle of firewood I was forced to purchase on a trip to upstate NY. Forced, because the campground has rules against ‘importing’ firewood from anywhere other than the immediate area around camp (to prevent the spread of harmful insects and disease). I have Photoshopped out the company name and website to sidestep any legalities. I will be focusing on the statements made, the symbols printed, the strange looking dude and lastly, the cat. This is something I really have a to give the big ‘thumbs down’ to. And that is only because I am avoiding using harsher language in mixed company. Is denuding the Estonian forest for firewood really necessary? Seems to me, we did the same thing here in the States and look where that has gotten us. If you compile a list of the fossil fuel consuming devices needed to bring ‘premium mixed hardwood’ all the way from Estonia, on the European continent, to your local supermarket, then you would agree that ‘ecological’ is the last thing that could be applied to this product. Keep in mind that most of these machines are powered by a diesel engine. Diesel fuel is one of the dirtiest commonly used fossil fuels used today. The powerful machines used to cut and strip the tree of its branches, slice it into manageable logs and load onto a truck are straight out of a Dr. Seuss cartoon. The truck then moves the logs to a processing plant where they are ‘kiln dried and heat treated at 160 degrees F for 75 minutes’. Heat for the kiln? Most likely natural gas. The treated logs, now ‘virtually pest and mildew free (but not 100%) are cut into smaller lengths, split, wrapped in plastic, palletized, wrapped in plastic again and loaded into a shipping container. Plastic is derived from crude oil. The shipping container is trucked to a seaport and loaded onto a ship, which then makes it’s way across the ocean to the US, (fueled by Bunker C, which is even worse than diesel), where it is unloaded, put onto another truck, moved to a distribution center, loaded onto yet another truck and taken to your local market where it sits available for the consumer at about $6 a bundle. And I may have missed a couple of loads/unloads there. The plastic wrapping goes into the landfill. To be sure, I give a lot of credit to my local supermarket. The owner is a generous member of the community and having firewood for sale is one more service he does for his customers. No foul there. But me thinks that, if he purchased the wood locally, from one of the many woodlots, or, if you, the consumer were to patronize the stacks that sit roadside in your neighborhood, it would go a long way towards reducing the worldwide carbon footprint. That, and you would be contributing your hard earned dollars to the local economy, including, at times, mine. The Estonian forest would be better off for it, allowing the Estonian woodland creatures to hang around and get stoned, or whatever it is that they do in Estonia. 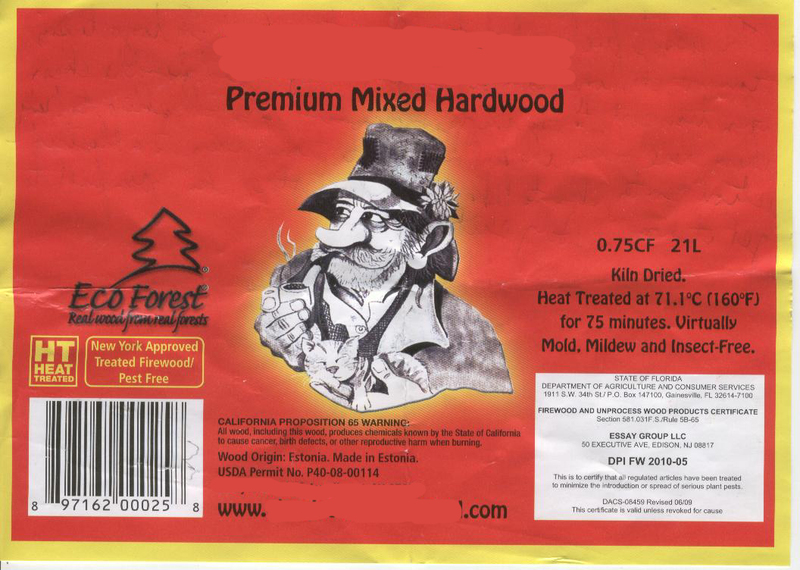 And why would you trust that shifty eyed guy on the label, smoking who-knows-what in that pipe, with a dead flower in his ancient hat, cradling a cat that is giving you the stink-eye, anyway? …and a new handle for the ax. Or axe, if you like. Both are acceptable spellings of the word. New work gloves and a new handle on the ax. Neither will look this good for long. You want to have a good pair of leather work gloves if you’re going to put any time in cutting wood (and a good pair of work boots, too). And, If you want to have firewood to burn through the winter, you have to put time in. You need to set yourself up a year ahead, because it takes a that long to dry green wood proper for burning. 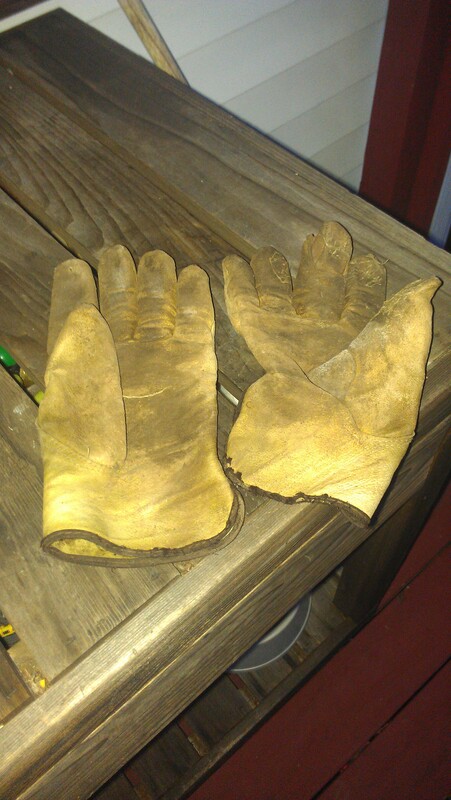 I go through about one pair of leather work gloves and one ax handle per winter. Two, if I don’t pull a muscle or hurt my back. It is a good gauge of the passage of time and of firewood cut. I’ve noticed over the years that the first finger to burn through is the right middle. Followed by either the left middle or my right thumb. Never the pinky. Go figure, I’m primarily left handed. But, like a majority of left handed folk, I am either partially ambidextrous, or have adapted to a right handed world. I actually have 4 left hand gloves that are still perfectly functional. I just don’t know of anyplace where you can get 4 right hand gloves. Further proof? I have tendonitis in my right arm. Not bad, but enough to restrict tossing split wood very far. Fortunately, it does not affect hoisting a beer. I used to keep my broken ax handles as a marker of work done. But one day I thought it was another one of those ridiculous things that people point out to prove what a screwball I am, so I burned them all. At the time it seemed like pack ratting. Now I think I could have nailed them to the wood shed, like so many trophies of work past. I have, however, retained a lot of old gloves. I use them for a lot of things. Being that only a couple of the fingers are burned through, the other fingers make good ‘hole fillers’. Cut one off, work it into the damaged glove and it will see you through till you get a new pair. Because, you know, sometimes it takes a while to get around to buying a new pair of gloves (for whatever reason). It’s a whole lot better than reversing a piece of duct tape and pushing up in there, although that will work also. But if you do that, you will collect a lot of crap on the end of your finger before the glue wears out. An old glove is good for sheathing the cutting edge of the ax. 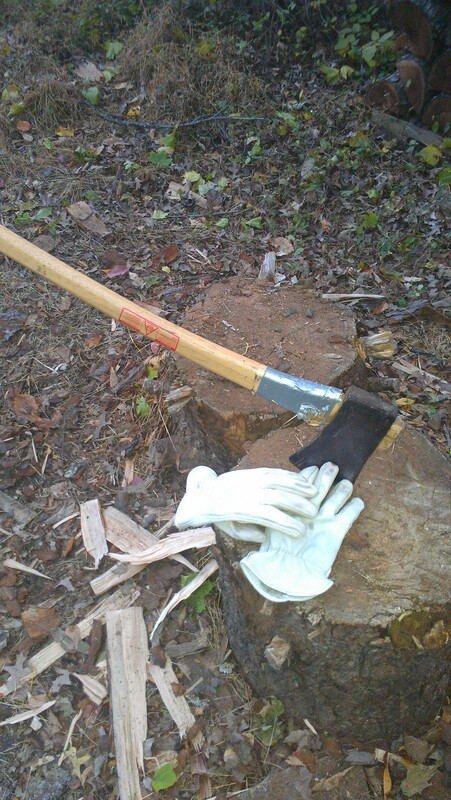 As every Boy Scout knows, when an ax is not in use, you cover the cutting edge, for safety. You might also wrap a piece around the shoulder of the ax (the part where the handle connects to the metal head) to protect it from getting beaten up. You can secure it there with a wrap or two of duct tape. Or you can cut all the fingers off and have a good pair of biking gloves or knuckle protectors for punching the heavy bag. A hunk of old leather is good for making a fast, temporary gasket between two water bearing pipes. It can provide a no mar surface if you need to pelt something with a hammer and not leave a mark. Same with pliers. It is good for some scrap to try out your leather working skills or to fill a hole in your shoe (or so I learned from the comics and cartoons). And they are quite good for the pouch on your homemade slingshot. Or you can just throw the friggin’ things in the garbage and not think twice about it. This is what they look like after a good winter of splitting and stacking, wiping sweat off, getting soaked, covered with mud and left to dry in the sun. If you look closely, you will see that the right middle finger is burned through and filled with the finger from another glove. Time to buy a new pair.